THE latest issue of Windsock continues Harry Woodman's popular scratchbuilding series with over a dozen archive model photos plus a number of the late author's excellent diagrams and sketches.Plenty of great modelling lore here with topics covering struts, undercarriages,rigging and the application of surface and other details.We have a colour spread of Stow Maries WWI aeroplanes from one of the museum's late evening photo shoots when there were plenty of photo opportunities for visitors;David Byers presents unique pictorial reference for the WWI German pilots' safety helmet; our latest centre-spread features further Sopwith Camel profiles for those modelling new WNW and Merit Camel kits; plus we have an in-depth preview of Aviattic's amazing new Ansaldo A.I fighter mixed medium production.The coverage is supported by archive photos and museum colour close-ups that will prove highly beneficial to potential Ballila builders. Accessory, kit and book reviews,plus readers' models and letters, round off another stand-out edition. Summer volume carries special photo and profile features for modellers building new Camel kits coming this year! 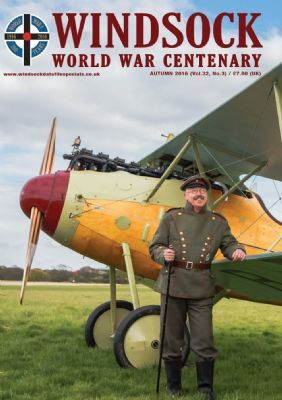 Coverage of the popular Italian WWI and post war Ballila fighter, with 109 rare photos and three view drawings.Includes three rear cover colour profiles- the ultimate modelling reference!